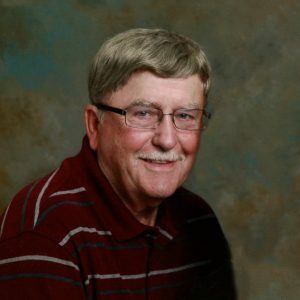 Gerald “Jerry” Robinson died Saturday, Feb. 9, 2019, at the St. Cloud Hospital surrounded by his family after a long struggle with a variety of medical conditions. He was 83. Services will be held at 11 a.m. Thursday, Feb. 14, at Kimball Christian Church with Pastor Jerry Albert officiating. Burial will follow at the Kimball Cemetery. Visitation will be from 3-7 p.m. Wednesday at Dingmann Funeral Care Chapel in Kimball with a prayer service at 7 p.m. Visitation will continue one hour prior to the service at the church Thursday. Gerald Vernon Robinson was born Jan. 12, 1936, in Kingston Township to Samuel and Allie Fern (Magnuson) Robinson. He was baptized as a teenager into the Church of Christ in Kimball. He grew up in Kingston Township and graduated from Kimball High School with the Class of 1955. He served in the U.S. Army from 1955-1958. Besides being stationed stateside, he also was stationed in Korea and Japan. Jerry was united in marriage to Janet Hinz Feb. 8, 1964, in Kimball. After pursuing careers as a meat cutter at Dassel Meat Market and an assembler at Ford Motor Company, Jerry found his true passion as a craftsman through creating wooden and cement lawn ornaments. He founded Robinson Wood Products in South Haven, which later became Robinson Wood and Concrete Products in Kimball and Royalton. After retirement, he kept busy assembling tools at Malco Products in Annandale, and building wood creations in his garage shop. Sports were always a big part of Jerry’s life. He loved watching the Vikings, Timberwolves, and Twins. He was an avid athlete himself, playing football, basketball, and baseball in high school. Jerry was the first athlete in Kimball High School to score 40 points in one basketball game. He continued to play football and basketball while in the U.S. Army. After his discharge from the U.S. Army, Jerry played town team baseball, independent traveling basketball, and intramural softball and volleyball. He was one of the first inductees into the Kimball High School Athletic Hall of Fame, and he was a member of the Old Coots organization with other former Kimball High School athletes. Jerry was such a kind, caring and loving man whose sense of humor created many laughs and smiles among family, friends, and even strangers including the medical staff who worked with him over the last few months. His caring ways and positive outlook on life were a big influence on the lives of his loved ones. Jerry cherished the time he spent with his family. He was their number-one fan, and he was very active in his children’s and grandchildren’s sports and activities. He enjoyed the great outdoors as a hunter in his younger days, and as a fisherman his entire life. He was excited about spending time with family and friends in the boat, in the fish house, and at the fish fry that followed. Jerry took pride in his yard, and he enjoyed time with Janet while working on creative landscaping projects. He also looked forward to frequent visits with his close friends at Knaus Sausage House, Gohmann’s Foods, and Hendricks Bus Garage. Jerry was preceded in death by two sons, a stillborn son and 19-month-old Keith Gerald Robinson; parents; stepfather Lafe Stanley; and siblings Waldo Robinson, Marvin Robinson, Lloyd “Tookie” Robinson, and Alene Borman. He is survived by Janet, his loving wife of 55 years; children Tracy (and Pat) Frank of Wells, Minn., Travis (and Robin) Robinson of St. Michael, and Tania (and Chadd) Novak of River Falls, Wis.; grandchildren Max Robinson, and Mason and Cadence Novak; nieces and nephews, great-nieces and great-nephews. Pallbearers are David Robinson, James Robinson, Bob Robinson, Terry Robinson, Scott Robinson, James Colberg, John Gohmann, and Casey Gohmann. Joyce Albert and Richard Eckman will provide music for the service. 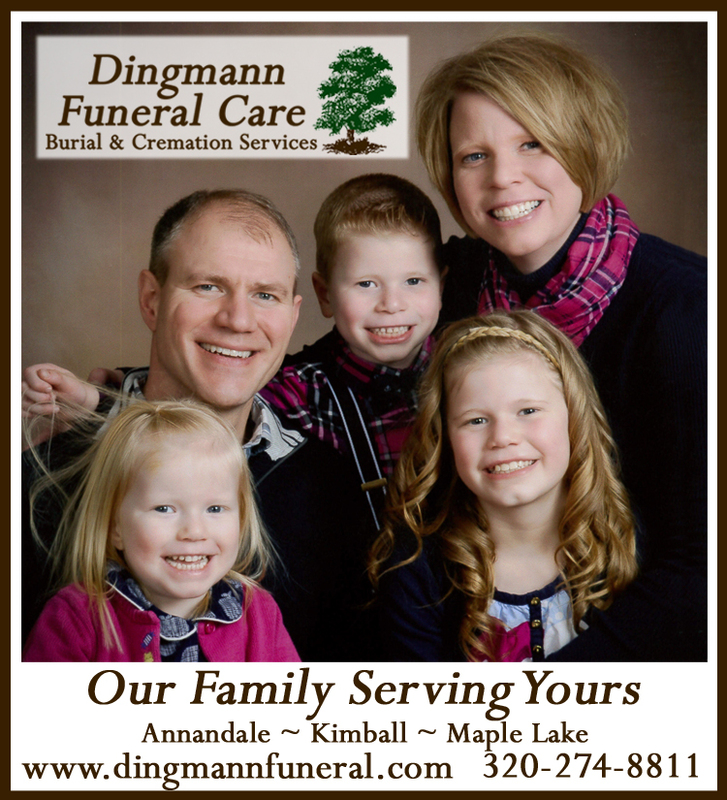 Arrangements are entrusted with Dingmann Funeral Care Burial & Cremation Services.